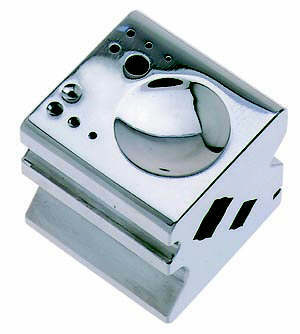 This versatile block handles your toughest forming, bending, creasing and grooving jobs. Combines an anvil, forming block and stake holder in a hefty 21 pound block. 2 inserts are designed to hold the forming and raising stakes. Hardened, tempered, highly polished tool steel. Block includes six shapes and surfaces: a V-shaped groove, a square groove, a half-round groove, shallow domes, radiused edges and flat anvil surfaces. High polished block to be used with Peddinghaus stakes.